I’m Nick and I joined the Thames Basin Heaths team as a warden in December 2018. After spending countless hours outside for this job, I have come to the realisation that my bird knowledge is patchy at best… At my previous job, I familiarised myself nicely with seabirds and coastal birds. However, they are a lot less colourful and much easier to identify than their jazzy inland cousins. This blog series is especially for those that are new to birding, like myself (and for experts to get a few laughs out of my feeble attempts to identify birds). I’ll aim to summarise new things I’ve learnt that could benefit those starting out in birdwatching. I’ll include lots of pictures and diagrams to supplement any information on a species that I mention. In the first blog of the series, I’m going to talk about my favourite sighting from the last month. Last week, I was lucky enough to spot not one, but two Dartford warblers out on West End Common! It was a very chilly day, but the warm sun must have enticed them enough to pop out and have a look around. 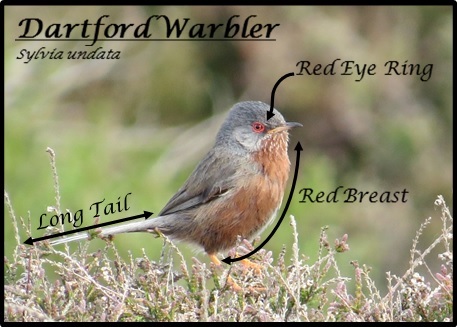 They are most commonly identified by their distinct song, one which I am yet to hear… However, I did hear a Dartford warbler call the other day whilst on Chobham Common, it’s a very distinct low, buzzy chrrrr sound. You will typically see the Dartford warbler perched on top of tall gorse bushes. I have always heard them before seeing them, so keep your ears peeled for their very distinctive call. As spring approaches, their song will light up the heath and they should be far easier to spot as they venture out from the dense gorse bushes. It’s a brilliant time to get started with birding… just pretend that the whole snow thing didn’t happen. There’s loads of time to familiarise yourself with common birds before everything bursts into life and our summer migrants make their way over! So why not join me as I attempt to progress from an amateur birdwatcher to a professional slightly less amateur birdwatcher?